Keter’s ‘Store It Out Ultra’ delivers a plastic wheelie bin storage solution to hide-away the unsightly appearance rubbish bins portray in a stylish enclosure, a swift wash down with a hose-spray simply restores the new condition in minutes whist composed of a make-up immune from weather decay. 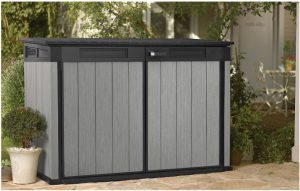 The Ultra regards Keter’s largest ‘Store It Out’ model, designed to assist a multitude of services, from storing gardening equipment, lawn supplies, a bike shelter, patio & BBQ accessories to swimming pool supplies, etc, etc; however its most popular service which receives the favourable thumbs-up relates to wheelie trash bin storage. Not everything is rosy though, many find security a disadvantage and the waver-able plastic rather old school when used for alternative services to hiding rubbish compared with the more modern yet sturdier design of the ‘Grande-Store’ for instance however this does come at a higher price, it depends on one’s desired services and requirements. A few cracked hinges, no replies to emails nor social media concerning missing or broken parts rather frustrates purchasers however Keter do come across extremely helpful in assisting purchasers with problems over the phone, hopefully this provides the avenue to take if you require support. Keter’s phone numbers for assistance, help and replacement parts are printed at the end of their Assembly Instructions. The Store It Out Ultra exhibits an unobtrusive stance, sits below the height of a standard 6 ft fence-line, locates in tight garden spots however it’s crucial to stand these horizontal sheds on solid level ground to fulfil their operational potential. 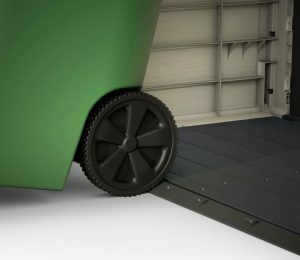 Solid ground delivers stability for the shed floor to survive the challenges heavy duty wheelie-bins endure whilst levelled foundations ensure a perpendicular stance to prevent leaning stresses to one side and deliver the doors vertical alignment to operate their correct swing. After reading through reviews it became apparent for us to prepare a solid level base for our shed location because the general consensus regarding the floor’s makeup, shed’s stance and operation of the doors & lid serves just as described from those who adhere to the stipulations. Our shed works great, after we complied! Manufactured from environmentally friendly recyclable polypropylene resin, molded into a ribbed inner layer whist reinforced with steel enhances rigidity. The outer-surface displays a stylish semblance of wood panelling inclusive of textured grain characteristics embossed throughout, shaded in either a brown/beige, grey/black or beige/green colours. Resin sheets constitute the make-up of the Store-It-Out Ultra. Two sheets either side including a thinner back plate adjoin to the floor, two front doors secure to the sides whilst concluding the three-door entry, an arched lid tops the Ultra off. UV protection blends within the polypropylene mix to stabilise the make-up with a shielding of armoury for defence against sunburn attack, withstanding a bleaching effect occurring and the manufacture splitting whilst under exposure to sun rays, the inherent issue regarding yesterdays plastic has been conquered. Polypropylene is the bees knees in terms of delivering weather defence without succumbing to decay, whether suffering damp conditions to inclement winters or red hot sunshine to the rain’s downfalls, Ultra’s impervious polypropylene composition is specifically designed to cope with weather stresses, remaining unsusceptible to deterioration. Cleaning polypropylene’s user-friendly surface can only be described as easygoing. The casual few minutes role to restore the shine generally regards either a light pressure-wash or a spray-hose down, a few minutes operation in anyone’s shoes. Ingrained dirt however requires a tad more elbow grease, virtue of scrubbing the surface with a softish brush, warm water & mild detergent. The key is to abstain from using abrasive cleaners in fear of scratching the resin. The Ultra tops off with a constitution of impervious polypropylene resin designed into an arched structure capping this horizontal shed off with a first-rate rainfall drainage system. A curved top averts rainwater puddling on top however unlike the rapid demise in composition roofing felt succumbs to when stood outside, commonly seen topping a wooden structure off, polypropylene endures weather attack being unsusceptible to decay. 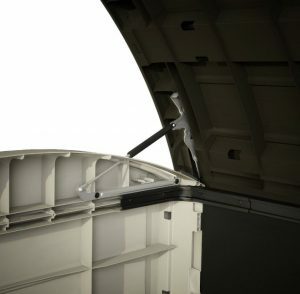 Imperative for bin storage relates to Ultra’s integrated ventilation. Built in air-vents situated at the top of both front doors generate constant fresh air circulation to the interior whilst providing an escape route for bad odours. Inside the lid a chain system is designed to link the wheelie bin lids to the Ultra lid. Open the Ultra top and the wheelie trash bin lids open simultaneously thus avoiding touching the bins when emptying rubbish. Purchasers adore the hygienic benefits delivered by this bin opening kit design, highly expressed through feedback. The Ultra has a heavy resin lid therefore to aid the opening of the weight, gas shock pistons installed either side deliver an easy opening mechanism by virtue of their hydraulic pressure forcing the lid ajar once the lid starts to open. Access is superb. 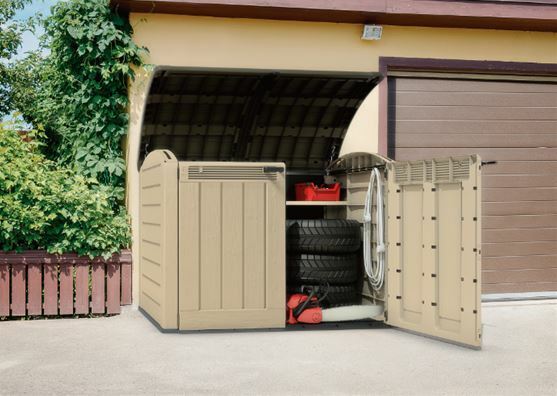 Store-It-Out’s are designed with a three door opening system, both front doors open via their hinges to aid wheeling in items whilst the lid can open independently to the doors on the frontage, purposely designed for wheelie trash bin services. A through-bolt with a built-in padlock clasp secures both front doors whilst leaving the lid to open, enabling rubbish disposal. Alternatively, to fully secure the two doors and lid together regards fitting the padlock a different way across the through-bolt, demonstrated by illustrations presented within the instructions. Padlock is not supplied. Two sheets regarding a thick bed of polypropylene resin interlink and secure with screws to make up the floor expanse. The base perimeter interlocks with the wall facade sheets enclosing the unit through a snap into place ‘Click’ system followed by securing the panels into place with screws. 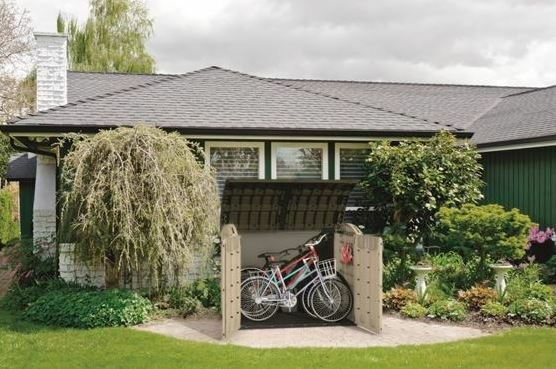 A sloped threshold presents at the frontage doors opening, specifically designed to aid the wheeling in of trash bins, bikes and lawnmowers etc. The only real crucial importance in accomplishing the floor’s full potential & shed’s overall serviceability regards being situated on solid level ground, as previously mentioned. 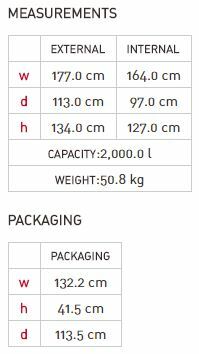 Measurements regarding this 2,000 L / 530 G capacity Store-It-Out Ultra are presented below. All wheelie trash bins do vary in size as do bikes & lawnmowers. 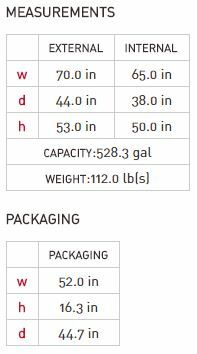 Best practice is to measure the internal dimensions with storage and external dimensions with the intended location to assure it serves requirements. 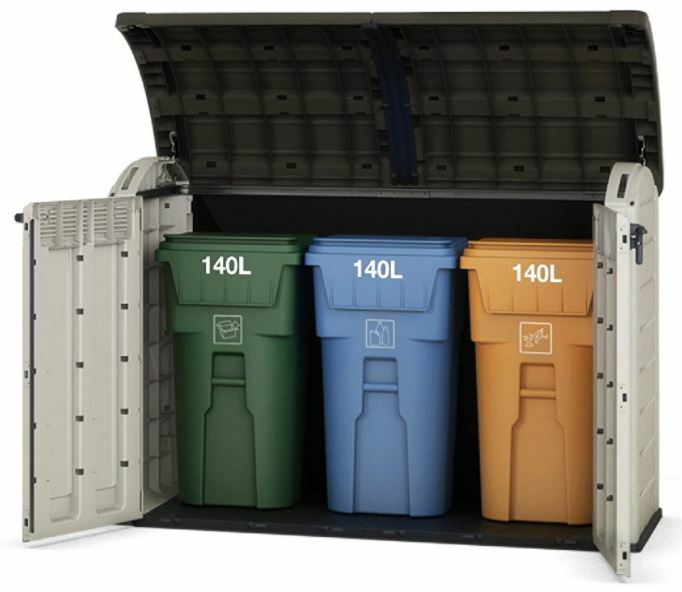 As a brief guide, the Ultra stores two 360 L / 95 G trash bins or three 120 L / 32 G wheelie bins. Bike storage regards 2 adult bikes with 2 children’s bikes. Many suggest the front wheels on larger bikes require turning to enable fitting in, hence why it’s advisable to measure the internal dimensions. 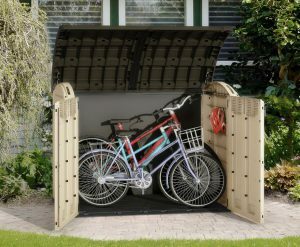 Lawnmowers, BBQ gear, gardening equipment, lawn supplies, kids toys, swimming pool supplies, mobility scooter shelters are all popular services however the Ultra seems to come across more favourable in reviews for their ability to attractively hide, store and serve household rubbish. First step regards locating this Store-It-Out Ultra on solid level foundations to enhance overall stability, serviceability and usage. Common household tools construct Ultra sheds requiring two people to assemble, one supports the facade panels whist the other aligns & secures into place with screws. Construction regards working through & implementing the order of illustrated steps demonstrated within the instructions, assembly roughly takes an hour or two. There is the option of securing the shed down into the foundations. Anchor indentations are presented within each of the 4 corners. The correct type of anchor screws have to be purchased separately as their type is conditional to the foundation material. Up to three shelves can be fitted inside the shed if required. Precise rectangular measurements are detailed in the instructions, thick plywood purchased at the local hardware store accomplish fitting perfect shelving. Shelves are fitted at specific points, resin ridges regard the shelf supports situated at the sides of the shed and secure with screws, each shelf has a maximum weight limit of 20 kg / 45 lb. Low-maintenance horizontal storage solutions encased in weather-resistant resin are becoming a popular alternative to escape the upkeep hassles outdoor wooden structures entail, especially those capped off with roofing felt due to their inability to survive damp conditions. 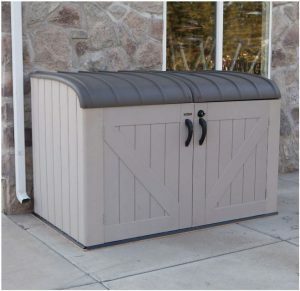 Keter’s Store-It-Out Ultra offers a low maintenance storage solution to enclose wheelie bins out of sight however their potential serviceability and usage is quite varied from occupying gardening equipment, lawn supplies, a bike shelter, work tools, swimming pool supplies, serving patio accessories, BBQ gear, wood store, etc. Ultra’s storage services are quite diverse. A polypropylene resin make-up boasts durability with rot & decay resistance whilst steel reinforced delivers stability however a few purchasers wish the waver-able plastic delivered more rigidity yet full appraisal shines through regarding Ultra’s easy-to-clean surface. 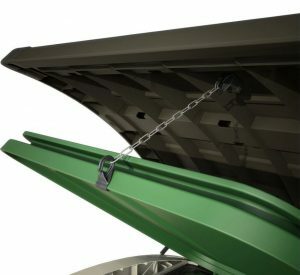 Quality features inclusive of hydraulic pistons aid Ultra’s hefty lid weight, their chain designed bin opening kit delivers a more hygienic method of emptying rubbish, the sloped threshold alleviates wheeling in frustrations whilst the built in floor is strengthened to cope with heavy duty pressures. There’s an abundance of advantages. Reviews are okay however Ultra’s presence has been downgraded somewhat through receiving damaged parts. 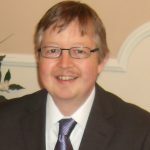 These issues could be overcome and feedback upgraded if Keter’s communication improved and sales sites mentioned the importance of locating the shed on the correct foundations. Keter are however very helpful over the phone and do sort problems out regarding replacements of broken parts so it’s best to sort issues out this way, forget email & social media communication. Just remember the solid level foundation stipulations. 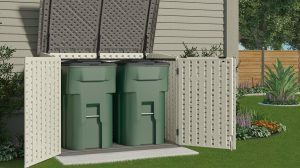 Thanks for reading about Ultra’s Plastic Wheelie Bin Storage solution. If you have any related low profile shed queries, please ask away in the comment section. 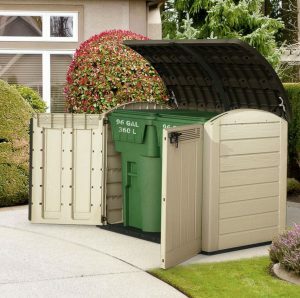 I am all dead set on a shed purchase from you, and now I find the plastic wheelie bin storage which looks like a GREAT alternative to having to put together the shed. 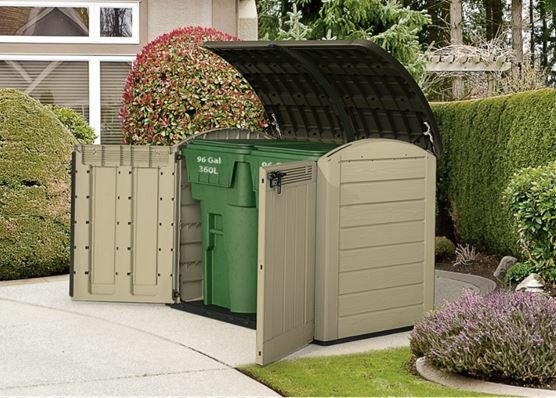 The pictures show using it for the trash dumpsters, but I can see myself putting all my garden tools, etc in this. What a wonderful idea! 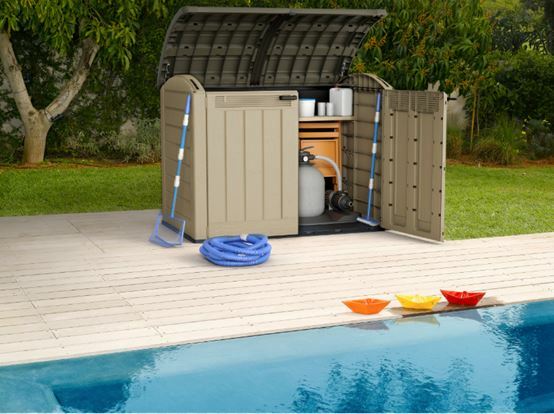 Thanks for reading about the Keter Store-It-Out Ultra, plastic wheelie bin storage solution. 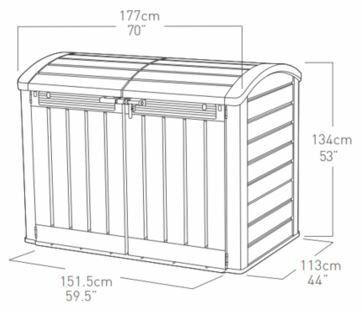 These styles of low profile mini sheds are a popular alternative to constructing a large walk in shed due to their ease in assembly upon comparison plus they get around planning laws if you’re in a restricted conservation zone due to standing below the height of a standard 6 ft fence-line. You are right, they a extremely diverse, it’s quite a common occurrence for people to purchase 2 or 3 mini sheds like this to serve their various outdoor storage.The reason I emphasise mentioning wheelie trash bin storage for Keter’s Store-It-Out Ultra is they receive mighty fine feedback for this service, hence the post title. 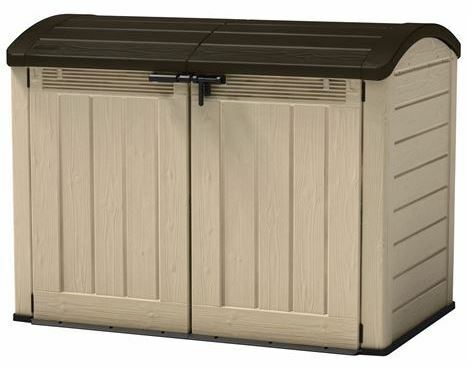 Reviews are okay for Ultra’s additional services however feedback regarding alternative models such as Lifetime’s Mini Shed or Keter’s Grande-Store for example do come across more favourably in terms of a more sturdier construction but they demand a higher price, it all depends on one’s storage intentions & desires.